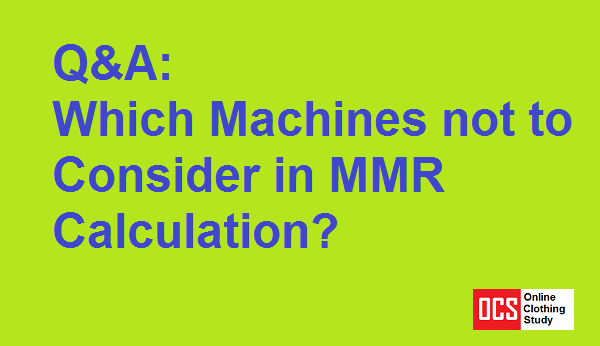 [Q&A] Which Machines not to Consider in MMR Calculation? If we look at garment manufacturing companies, some factories do not have in-house embroidery section or screen printing section or washing plant. If I have all facilities in my factory, manpower count increases significantly compared to machine count of a factory having only sewing machines. Under such circumstances how do we compare MMR of one factory to another? … This question is asked by an OC reader. I invite you to share your opinion on this discussion. With this regard should he count non-sewing machines while calculating man to machine ratio? They have in non-sewing machines like pressing station, spotting station, special pressing machines in finishing like buck presses, etc, straight knife cutting machines, band knives, embroidery machine, screen printing machines, heat transfer machines, shirt folding stations, garment washing tumblers etc. What about sewing machines those are used in finishing section? I have posted an article on man to machine ratio calculation method. In the previous article we had lot of discussion and questions on the MMR in the garment industry. Normally stitching machines are considered in man to machine ratio (MMR) calculation. So you should follow that method and include only stitching machine that are currently in use. What you are saying is right -- factories having printing and embroidery section would have different man to machine ratio compared to factories those don't have in-house print/Embroidery section. Even it has been observed that many factories only do production. Their merchandising, sampling, fabric store and administration departments are located in different location (normally at head office). In the both cases count only count stitching machines. I would like you to share your opinion/thought on MMR calculation on the above scenario. Or you can simply share how you calculate the MMR in your factory. Online Clothing Study: [Q&A] Which Machines not to Consider in MMR Calculation? Questions on man to machine ratio calculation.